Namibia has the most stable government in African and supports strong environmental and anti-poaching laws. It's a fascinating country with geography that ranges from the photogenic Namib Desert to arid mountains to dry savanna to the lush Zambezi region of the north. Game animals wander freely even outside park boundaries, and specialty birds of southern Africa are numerous. For these reasons it's a pleasure touring and birding the country. Our Central Namibia tour begins immediately upon arrival at the airport in Windhoek. Birding there and at the sewage ponds is followed by an overnight stay at Daan Viljoen National Park. The tour proceeds into the arid west with key stops along the way including an overnight near Spreetshoogte Pass. From there it continues to Walvis Bay, then the Swakopmund Salt Works and Spitzkoppe en route to the Erongo Mountains. An overnight stop in the mountains picks up some important specialties before proceeding to Etosha National Park for 3 full days plus 2 half days of game drives and birding. From Etosha transfer to the Waterberg Plateau area for an overnight stay. 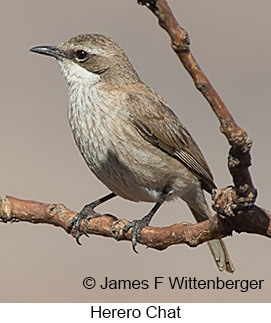 After a final morning of birding around Waterberg, return to Windhoek for departure home.